What's darker than black? 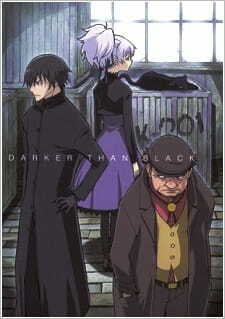 Darker than Black of course! Darker than Black: Kuro no Keiyakusha combines action and mystery into science fiction super power madness. A perfect and exciting combination to keep us entertained to the end. What if contractors existed in the world that was able to use super powers for good or evil? What would you do if you were a contractor, working for a secret government organization to carry out tasks without question? What if you are tasked to eliminate everything that is considered your rival? Could you do it? This is the story of Hei, a contractor working for a secretive organisation called the Syndicate. He undertakes various espionage and assassination missions all for the Syndicate. He is on a mission to find the truth behind 'Hell's Gate' and what had happened in the past. His journey to find his lost sister and revenge on his former friends leads him to a destructive end. Hei is accompanied by Huang, Mao and Yin to accomplish the Syndicate's orders. Along the journey, Hei comes to realize his true self and identity which leads to slowly drifting away from the Syndicate and acting upon his own will. The story is quite complex and enjoyable, the mysterious are deep and the characters are always secretive. You do not know the truth until the end of the series. It was entertaining and captivating to watch. The animation and art style of Darker than Black are superb. Each character is completely unique and unlike some other shows with several similar looking characters, Darker than Black does an excellent job of giving each character an unique style and a winning personality. The fights of Darker than Black are done very well and are very fluid. Although short at times, it is after all not a shounen series, they are excellent none the less. Some fights are extended and are a real treat for the eyes. The soundtrack was superb throughout this anime. The opening and ending theme songs were quite catchy and suited the mood of the anime perfectly. Voice acting was also in sync and suited the characters. The anime contains an excellent mix of various genres of music. At one point it will be a jazz track, then later it will be an orchestra piece or a rock track. Overall the music is really well done and accurately depicts the scene. The characters are the real mystery here. You do not understand how the contractors work until later in the series. At first, it may seem Hei and the team are the villains in the anime, however, after watching the first couple of episodes you come to realize the true intentions of Hei and why he is against the government. Huang is the team's leader which gives strict orders directly from the Syndicate and Mao(yes, he is a cat) is a sidekick that mainly does recon and spy work. Lastly, the ever mysterious Yin is the team's tracker; she can keep watch at anything anywhere. Other characters which I won't mention here are also quite interesting and have their own personalties that differ from one another. It was great to see a distinct appearance of all characters in this anime so you will not get bored. Overall, it was fast, fun, and frightening. The action was intense and the battles were fierce. It was a pleasure to watch two contractors fight aggressively with each other using their unique powers. The anime was fun; the mysterious were deep and though-provoking, the characters were lovable and laughable at the same time. It was frightening because you didn't know what was going to happen next. Anything is possible in Darker than Black. I enjoyed the anime a lot. It was an exciting story from start to finish. Entertaining and engaging; what a sci-fi superpower action anime should be. Battles were animated fluidly and illustrated superbly. Characters were uniquely drawn between one another. Theme songs and background music livened the mood appropriately throughout the anime. Mysterious and full of deceptive characters sown throughout the series. You don't now what to expect. Fast, fun, and frightening. It was enjoyable to watch. With so much going on and so much fiction, it's hard to keep track of who is who and what is what. Thank goodness details do get explained little by little in the anime.